Neptune has a new freckle. 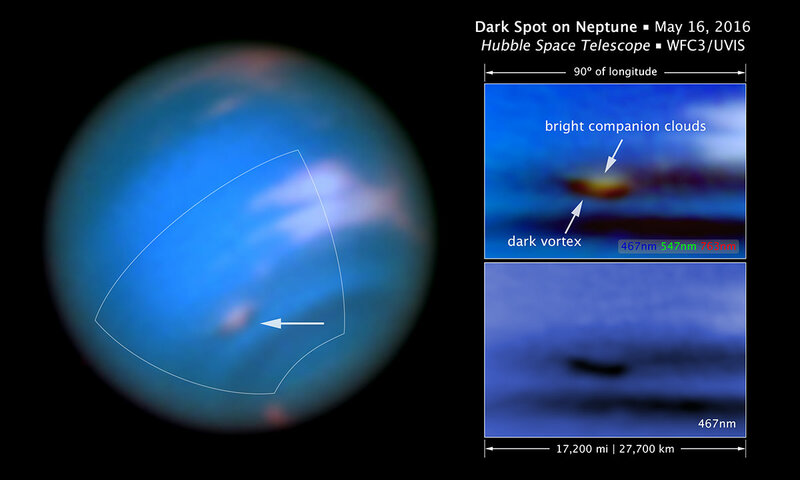 On 16 May, images taken by the Hubble Space Telescope confirmed that there is a dark vortex in Neptune’s atmosphere – the first such spot seen in the 21st century. The gas giant’s most famous feature is a permanent storm in the southern hemisphere called the Great Dark Spot, comparable to Jupiter’s Great Red Spot. Neptune’s stormy weather is driven by the strongest winds in the solar system, which reach as high as 2100 kilometres per hour. Because it is so cold, Neptune’s atmosphere has a lot of ice crystals, which give the planet its bright blue colour. Occasionally, a smaller storm will appear, giving astronomers a chance to study how they form and evolve. This is only the fifth such blemish ever seen – the first two were discovered during the Voyager 2 flyby in 1989, and Hubble saw two more in 1994 and 1996. They are often associated with bright “companion clouds” of methane ice that form when the airflow is diverted above the dark vortex.. Amateur and professional astronomers began seeing such bright clouds back in July, and thought they might be the harbingers of a dark vortex lurking underneath. But the vortices are only visible in blue wavelengths, and only the Hubble Space Telescope has high enough resolution to see them so far away. Hubble next looked at Neptune in September, as part of the Outer Planet Atmospheres Legacy (OPAL) programme, a long-term project to map the outer planets every year. Sure enough, the telescope spotted a dark smudge close to where the bright clouds had been tracked from the ground. The second look in May confirmed that it was a long-lived storm.